This holiday season, for the first time in Atlanta, one of America’s favorite Christmas movies comes to life on stage in a hilarious, large scale Broadway musical, at the Fox Theatre from November 29 – December 4 as part of the 2016/2017 Fifth Third Bank Broadway in Atlanta season. A Christmas Story, The Musical chronicles young and bespectacled Ralphie Parker as he schemes his way toward the holiday gift of his dreams, an official Red Ryder® Carbine-Action 200-Shot Range Model Air Rifle (“You’ll shoot your eye out kid!”). An infamous leg lamp, outrageous pink bunny pajamas, a maniacal department store Santa, and a triple-dog-dare to lick a freezing flagpole are just a few of the distractions that stand between Ralphie and his Christmas wish. 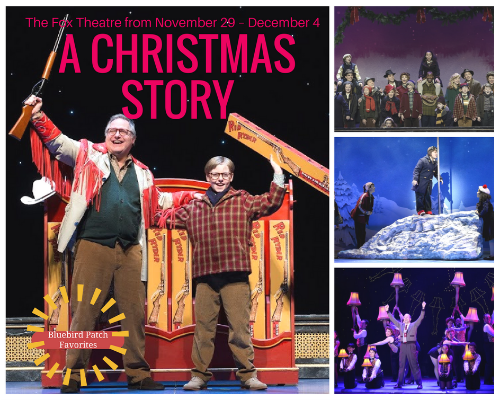 Chock-full of delightful songs and splashy production numbers, A Christmas Story, The Musical, has proudly taken its place as a perennial holiday classic for the whole family. Tickets go on sale Sunday, September 18. Tickets start at $33.50 and are available by visiting www.BroadwayInAtlanta.com/Christmas, calling 1-855-285-8499 or visiting the Fox Theatre Box Office (660 Peachtree St NE, Atlanta, GA 30308). Group orders of 10 or more may be placed by calling 404-881-2000. Performance schedule, prices and cast are subject to change without notice. For more information, please visit www.bigleague.org or www.BroadwayInAtlanta.com. A Christmas Story, The Musical will play at Atlanta’s Fox Theatre November 29 – December 4. Saturday: 2 p.m., 8 p.m.
Sunday: 1 p.m., 6:30 p.m.
A Christmas Story, The Musical features a festive and nostalgic holiday themed score by composer/lyricist team Benj Pasek and Justin Paul, with a book by Joseph Robinette, based on the writings of radio humorist Jean Shepherd and the 1983 holiday film favorite. A Christmas Story, The Musical is produced by Big League Productions. Led by President and Executive Producer Daniel Sher, Big League is celebrating its 26th season of producing, general managing and booking Broadway musicals and special attractions for touring throughout North America and the world. For more information visit www.bigleague.org.